Coco Bliss is a 100% natural by-product of coconut harvest. Coir consists of the coarse fibers extracted from the husk on the outer shell of a coconut. Coir has superior water holding capacity allowing for excellent air space and drainage. Coir can be used soil amendment for potted plants, containers and gardens and is a sustainable alternative to peat moss. Coir is easier to hydrate and lasts longer in soil than peat moss., all the while not destroying natural peat bogs. Coco Bliss has a neutral pH of 5.8-6.8. It can help break up hard clay soils so that nutrients can be used more efficiently. Adding one part coir to two parts soil or potting mix containing compost creates and excellent growing medium for gardens, planters, and raised beds. Coco Bliss comes compressed into 10 lbs. bricks, which makes for easy and convenient storage. Add water and soak your brick for at least 1 hour before using it. A fully-hydrated brick can hold eight to ten times its volume in water. The final volume of the expanded coir depends on the amount of water used to constitute it. 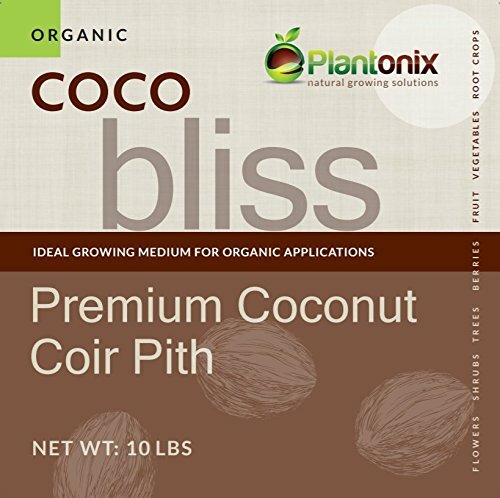 Plantonix Coco Bliss is fully washed multiple times to reduce the risk of salt buildup in your soil. Our coco coir products are organic, guaranteed to be very high quality and very low salt content. Very low level of EC is attained by repited washing with fresh water. Renewable, Biodegradable & Ecofriendly, Stable PH and EC. Hygroscopic and easy to wet, retains 8x its weight in water. If you have any questions about this product by Plantonix, contact us by completing and submitting the form below. If you are looking for a specif part number, please include it with your message.